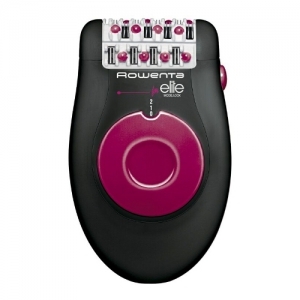 This epilator is small and handy, so it’s easy to carry it in one hand while using it, and very light too. That makes it very confortable to use. The thing that I liked the most about this epilator is that the head can be taken off and washed with water without any problem. in one of the sides to take it off easily, and is easy as well to put it on again. After washing the head, it’s important to dry it well with a towel and wait until it’s dry enough, as it can stand water, but the epilator doesn’t. Of course to remove hair always means having to endure some pain, but I have noticed that when using this machine is less painful than with other ones that I have used. It’s not painless, but if you can get some help to endure it while making yourself look prettier, that’s welcome. to be used to reduce the pain while you’re removing your body hair. I don’t know if it’s because of this or not, but I can notice the difference. It can be used with two different levels of speed, but I always used level 1, as it was good enough for me. to spin faster, then try level 2. I think that the effect is the same and it’s more noisy, so that’s why I prefer level 1. The price is average with other epilators, and I think that it’s a very good product. It’s not specially aggressive with the skin, removes the hair well, and is a good option for people who are specially sensitive to pain.